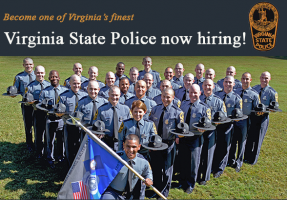 Virginia State Police are now hiring State Troopers, and a recruiter will be in the Macy’s Court at Manassas Mall on August 8th, 2018 from Noon- 3pm to discuss employment opportunities. If you are looking for a rewarding career path, becoming a Virginia State Trooper could be the answer. Being a Virginia State Trooper is more than just a job. Troopers not only uphold the laws of the Commonwealth of Virginia, but also serve & protect the communities where their fellow Virginian’s live and work.